Every time I write a story I ask myself the same, simple two-word question: “So what?” If an answer doesn’t immediately pop into my head, having re-read what’s in front of me, I tear it up, push the delete button, and start over again. That’s not to suggest everyone who reads my stuff arrives at the same “so what?” answers that I do. But it’s a good little exercise for writers nonetheless. Asking “so what?” also serves the angler well. “If I cast there, against that rock, and the 20-inch brown trout I think lives in that run actually comes out and eats this grasshopper, so what then?” As anglers, we often focus exclusively on the goal at hand, wanting to make that perfect cast, hoping to get bit. But if the real goal is landing the fish, a little more “so what?” thinking is usually in order. “If I hook the fish here… my best guess is that the fish will want to run straight for those weeds over there… or downstream into that hole…” In other words, asking “so what?” is hypothesizing what happens next. I think you get my drift. If you plan what happens next, or at least what you think might happen, before you unfurl that perfect cast, you’re going to set yourself up for more consistent success. You should ask “so what?” and then let that dictate almost everything, from the fly pattern you choose, to where you position yourself relative to the fish, to the type of cast and presentation you make. And that’s true on the river, the lake, or the flats. 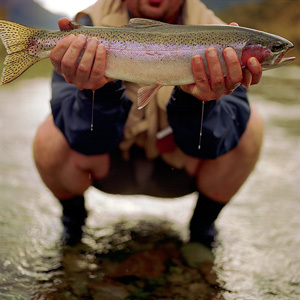 Fly fishing is a sport of actions and reactions. It’s taken me years to figure out how to line up those actions in a way that actually works. And even then, even when I do everything the way I was taught, I’m still often made to look the fool by the fish on the other end of the line. That’s the reaction part—the part that’s much more subtle, much less predictable, much less consistent, and much harder to understand. Learning to anticipate the reaction of the fish, the reaction of the water currents as you drop a fly in them, and other factors will help differentiate the great angler from a fair one—just like anticipation, reaction, and improvisation separate a great jazz musician, in this case Miles Davis, from others. You’re never going to get it right every time. So what? You should still try.